Now that we’re settled into our expanded parking lot along York Road, it’s time to begin resurfacing the west lot. Starting This phase of the construction project will occur in two stages to maximize the amount of parking spaces. Once again, we thank you for your patience and flexibility during these changes. This will bring our overall Christ Church construction project one step closer to completion! Things are moving quickly on the corner of 31st and York! Get a close-up look of the progress being made by our hardworking construction team. You may not see as many construction workers on the outside of the Christ Church project, but they are still working as hard as ever! 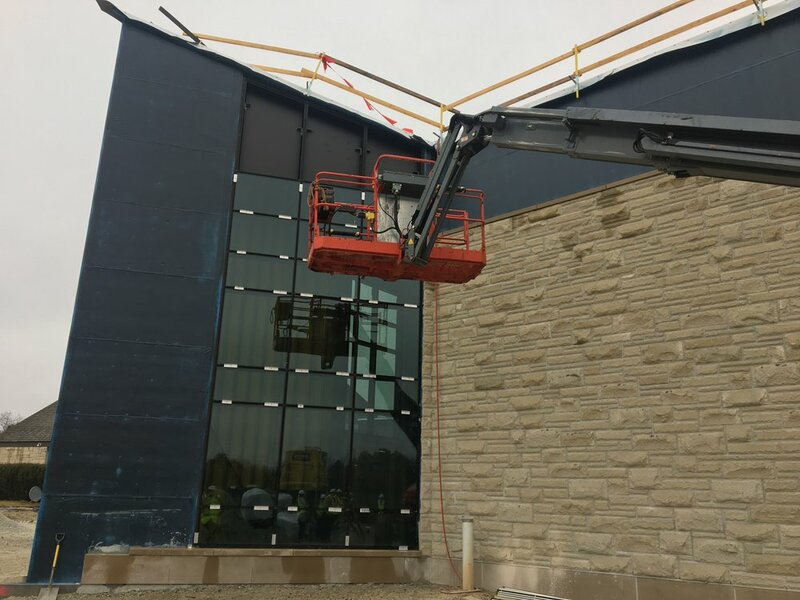 Every day, there are about 40 crew members working on the interior of the building and the new worship venue - just in time for the cold weather! Below are a few updates on what you may be seeing outside and what's happening beyond the new walls. The new worship space is now fully enclosed. New HVAC units were placed on the roofs of the existing building and the new addition. The roof has been added on the new addition. Water lines have been run from the original building to the new addition. The crew is preparing to pour the concrete flooring in the next few weeks. On a chilly morning in late November, the staff of Christ Church watched one of the final large, exterior pieces of the new worship venue, lifted up to its place in the grand structure, a place where hearts will be touched and lives will be changed through the power of the Holy Spirits active presence in our church. In the weeks prior, many of us had the privilege of signing the beam, writing our prayers for the new space, hopes for the our growing church, and words of immense gratitude for the work God has already begun to do in and through this movement. As we watched our prayers rise up and be put in place in this giant construction puzzle, we stood in awe. Feeling moved by the moment, one by one, we began singing the Doxology. The East entrance to 31st Street is now completely open. We have light! Lights are on in the South lot and the majority are on in the West lot. Temporary sidewalks and lights from Door 2 to the West lot will stay in place until spring when we complete the “island” and the accompanying driveway. The final steel placement in the new worship space is complete! Installation of the ductwork, electrical and plumbing are under way in the lower level of the Auditorium. More and more construction milestones are being reached every day and we are thrilled to have been able to open the South parking lot ahead of schedule--it is such an exciting time at Christ Church! Our crews are still completing the electrical connections for switching for the overhead and walk-way lights. If you are in the building after dark, we encourage you to plan ahead and bring a flash light the next few weeks to ensure your safety. 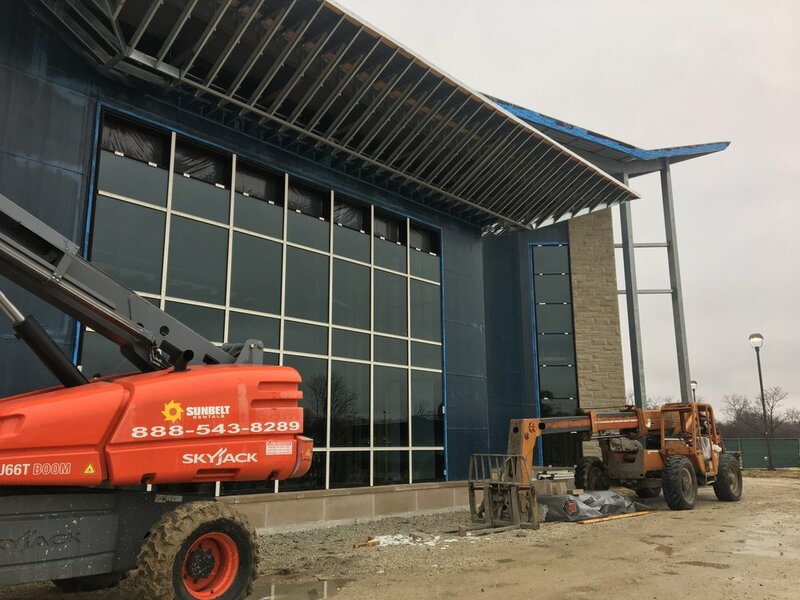 The construction team is erecting the steel on the south half of the new contemporary worship building so it is taking shape more and more each day. Thank you to the entire Christ Church family for your generosity and grace during this time of construction. We are excited and thankful to finally celebrate the abundance of parking spaces in our new lots. Now that there is enough parking for all, shuttle services will suspend effective immediately. Though construction continues, we are excited to announce that the South parking lot and both entrances off of York Road will be reopening this weekend, ahead of schedule! There will be more abundant parking and a new roadway that allows convenient access between the South and West parking lots. Members of our staff and hospitality teams will be on site to welcome you and direct traffic, but please be cautious in anticipation of new pedestrian traffic patterns as well as new stop signs and turn lanes for entering and exiting our campus. Removed construction equipment from the West Lot that was occupying some needed spaces. Secured an additional satellite parking lot for choir members and staff that will allow the entire Butler School lot to be available to other members and friends – a gain of some 100 spaces. Crafted this week’s worship services to allow more exchange time between our services than the unusually long services occasioned by last weekend’s Multisite Announcement. Taken measures to clarify pick-up and drop-off procedures with our shuttle drivers. Together, these changes should make parking this weekend a much better experience for all. The best news is that (barring major weather problems) by mid-October—just a few weeks away—we will have the use of our new parking lots. At that point, we will have more parking spaces than ever and be able to enter the lots from either York Road or 31st Street. We are almost there, so thank you for your perseverance as we together root our lives more deeply in Him for the sake of others. PLEASE NOTE: Shuttle services will drop off all congregants at door 6 for convenience to both worship spaces. Construction progress is being made daily and it is hard to miss all the work going on around us. While at times it can be inconvenient, please stick with us through the dust—it is an exciting time to be part of this ministry! Just imagine the thousands of people with whom we will be able to share the life-changing love of Christ in the season ahead. The south parking lot along York Road will be closed effective Monday, August 21, 2017. Our hope is to open the newly completed lot around the end of October. Please start using the 31st Street entrance. Shuttle services will start this weekend, August 19/20, taking congregants in the west parking lot (along 31st Street) and at Butler School (2801 York Road), directly to door 6. A new pathway will be accessible from the west parking lot directly to door 2. Parking lots 2 and 3, south of the church on York Road, have been cleared and leveled and should be completed by Labor Day. Our new South Pond is coming along. The retaining walls are three-quarters complete and work on the final wall is underway. The foundation walls for the new contemporary worship auditorium are nearly complete. If you look closely you can already see the lower level! 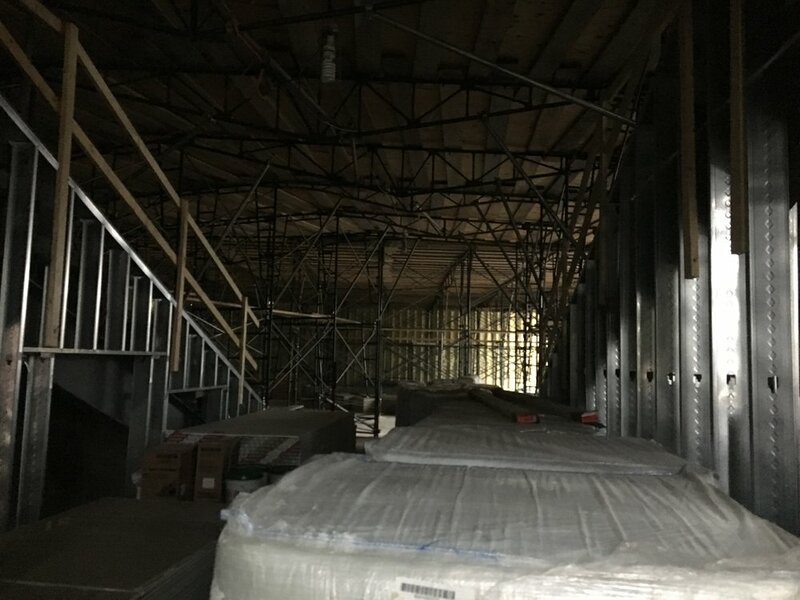 As we prepare our campus for long-term vitality and impact, we may have strategic building closures from time to time on various weekdays to ensure the convenience and safety of our church family. This will be the case on Monday, August 14 from 7:00 am until 12:00 pm. The building will be opened for the afternoon and evening. Changes are happening quickly at Christ Church! Below are some photos of the progress. 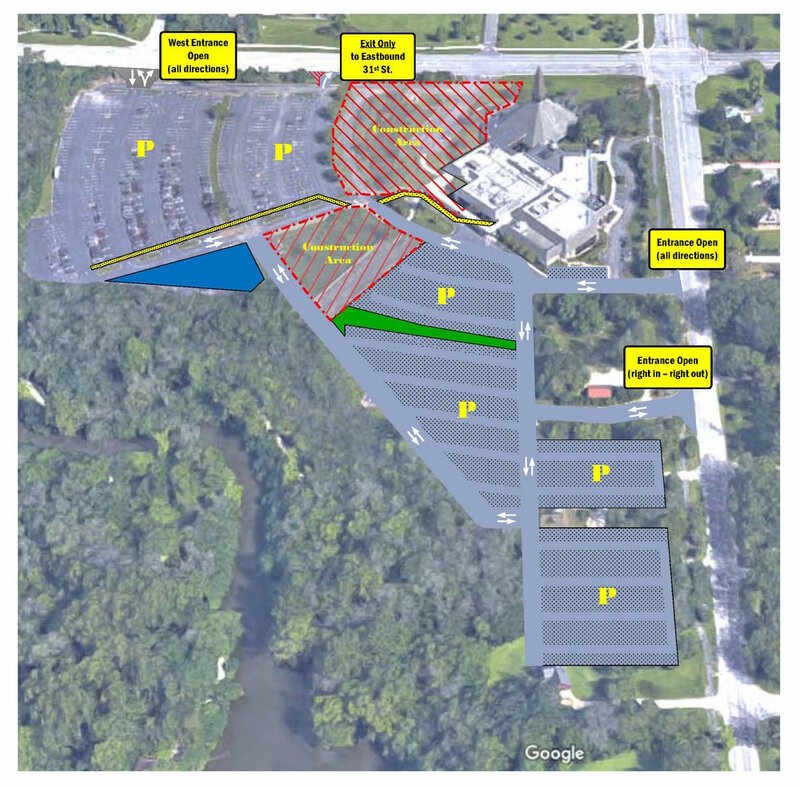 As you can see, the foundation has been set for the Contemporary Worship Auditorium and the retention pond on the west side of the parking lot. Additionally, the parking has seen some shifts as new entrances have been opened. The east entrance on 31st Street is partially opened for Sundays for those exiting to the east. The new west entrance from 31st Street is paved and opened with an additional exit headed west. Please start entering the parking lot whenever possible through our new "all-way" entrance on 31st Street in the west lot to help us minimize congestion. With the entrance off of York Road in our south lot now closed and an additional row of parking sectioned off, this will be the most convenient way for you to navigate and find parking more quickly. The building will be CLOSED Monday, July 3, 2017 until 12:00 pm. It will open at noon, but please check with your groups to ensure you will still meet on this day. Over the past few weeks, some significant changes have been made to the building and parking lot entrances to the church. These changes include closure of the west entrance to the West Parking Lot off of 31st Street and closure of Door 1. In addition, fences have been moved around due to the expansion of construction areas and the installation of retaining walls around the South Pond. Please check out the images below for current section closures as well as new walkways that have been added to help all of our congregants get to and from the building easily and safely. Check back here or on signage around the building throughout construction for regular updates. Please note the legend on the top left of the image to help you identify what you are looking at. Pardon Our Dust! Construction is under way. Over the next few weeks, you will begin to notice the mobilization of our contractors onsite with fencing put up in the west parking lot to prepare us for the beginning of our construction efforts. We will continue to post updates on this site throughout construction, so please check back often for the latest information. Starting April 30, for the groundbreaking ceremony, the Choir Parking Lot and the sidewalk from that lot to Door 1 will be closed until the completion of our new addition. Following our groundbreaking, Door 1 and our Narthex will be closing on Monday, May 1. There will be convenient pathways from the Commons to the Sanctuary to ensure all of our church family has continuous access to our traditional Classic services. Accessibility for all ages, stages, and abilities will be available. Join us for the Take Root groundbreaking on April 30 as we celebrate this defining moment in our history! Hear a word of dedication from Rev. Dr. Daniel Meyer, Senior Pastor, and join us in prayer for the season ahead. The groundbreaking ceremony will be held in the choir parking lot from 10:15 to 10:35 am. Be sure to wear your Take Root t-shirts to help us celebrate this milestone! As we start site work in the coming weeks, select staff will have to temporarily relocate their offices. Please be sure to check digital signage weekly to find out where they are located or feel free to check in with the front desk.